I have an original Memory Roth painting on my dining room wall. When Memory asked if she could paint my wedding photo, I knew she was talented and would do a great job. What I wasn't expecting was to feel the emotion I did. I have never seen an artist who can recreate the feeling, emotion and personality of a photo like Memory can. When I first saw my painting I had to choke back the tears. Every person who comes into my home comments on how exact the painting is to the actual photo, and how you can see our personalities. Memory is painting a portrait of our dog Jackson. When I saw the first stage of the painting I was shocked. She didn’t just paint a picture of a dog. She painted Jackson. She captured his personality, his soul. My dog will forever live on through her painting. Overall Memory is an incredible artist, whose passion for art shines through in every single painting she does. I started with my first commission about 4 years ago with "The Paper Boy" which was done from a picture of our son Jake delivering the paper to a friend of his nana's, it is so life like and as we know kids grow up very fast, so when we look at it we are reminded to take a moment and enjoy them while they are small. The second painting we bought from Memory, “The Turtle” was not a commission, but a painting my mom saw the progress of; she mentioned how pretty it was so my sisters and I decided to get it for her as a gift. Since the original had already sold we bought her a Limited Edition Giclee. The latest piece my sisters and I bought, again a commission for our mom, was of our dad who died 10 years ago in a motor vehicle accident. 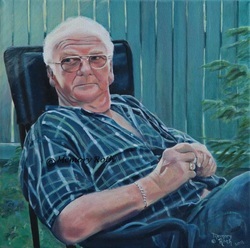 We all have the same picture of him the September before he died, so I approached Memory to see if she would paint it for us to give to mom at Christmas, she was more than willing to do it for us. It was amazing to see it come together over the weeks and we were always looking forward to her updates. We gave it to her before Christmas at a brunch with just us girls, she absolutely loved it. I look at it every time I am at her house, it is like he will come right off the canvas. Memory's attention to detail is amazing and I always look forward to seeing what she is working on. I can't wait to commission another painting and continue my collection. Thank you Memory for helping us keep Dads memory alive. In June 2009 my sister purchased her very first home. I wanted to purchase a really special housewarming gift for her. I knew that my very good friend Memory Roth painted and thought I could ask her to do a painting for me. 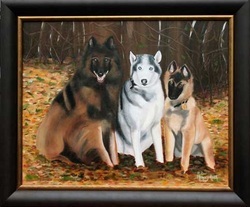 I approached Memory about doing a painting of my sister's dogs Jaeger, Vader and Havoc. I spoke with Memory and asked her how she would feel about taking on a commission piece. We got together and I brought some photos that I thought we could use for the process. We had great discussion about what I was looking for in the painting and the emotion behind it. Through out the whole process Memory and I spoke and she kept me updated with email photos of how the painting was coming along. The day the painting was ready for pick up I was so excited to see it completed. It was exactly what I wanted my sister to have. My husband delivered the painting to my sister in Calgary and she was overwhelmed that we had done this for her and she loved it. Approximately one month after I gave my sister the painting her dog Jaeger passed away. We are very happy with the way the painting turned out and appreciated being involved through the whole process. This was Memory's first commission and first animal painting. I had the amazing experience of being invited into Memory Roth's artist studio. I immediately was overcome with love and joy as each of her soul painting seem to open up and speak. Memory's art comes from such a deep creative spiritually connected place and it was an honour to be present to such soul driven painting. The eyes of her polar bear still resonate in my psyche and my spirit so gently moved still can feel the essence of her passion.,I was inspired and if you have the opportunity to see Memory's work I know you too will recognize the soul that speaks in every one of her amazing paintings!! Thank you Mem!! !